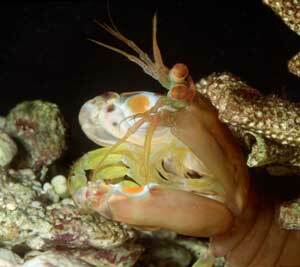 Stomatopods are commonly called "mantis shrimp" for an obvious reason. Despite their importance to reef communities, little is known about them. We do know that they have a rather long fossil record that dates back 400 million years. Such a long fossil record helps researchers understand the evolution of some the more intriguing features of this grouptheir mantis-like arms and the eyes. 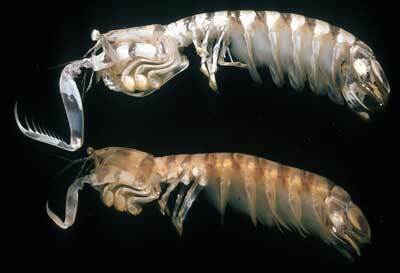 Stomatopod eyes, which allow them to see polarized light, are some of the most complex among animals. Click on the buttons below to learn more about the Stomatopoda. You can learn more about stomatopod behavior by clicking Stomatopod Life History! Visit the UCMP special exhibit Secrets of the Stomatopod: An Underwater Research Adventure to learn more about some of the unique features of stomatopods, and about a 2001 research expedition to study stomatopods in their own habitat. And check out Roy's List of Stomatopods for the Aquarium.